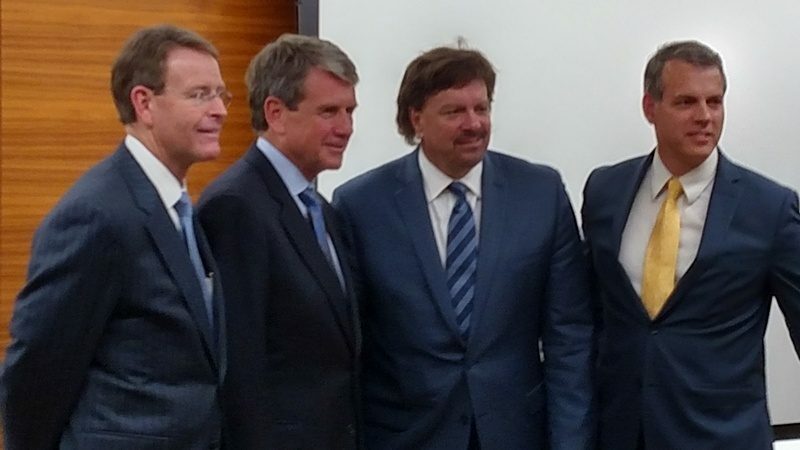 FRC's Tony Perkins, ADF's Mike Farris, James Dobson Family Institute's Tim Clinton, and HSLDA's Mike Donnelly pose after July 26 event at Museum of the Bible. While some Religious Right leaders recently warned against “human rights inflation,” another group gathered last week at the Museum of the Bible to assert that homeschooling is a fundamental human right protected by international agreements that recognize the rights of parents to direct the upbringing of their children and pass their values along to them. The panel discussion was organized by the James Dobson Family Institute, the latest project of Focus on the Family founder James Dobson. It featured Alliance Defending Freedom President Mike Farris, Family Research Council President Tony Perkins, the Home School Legal Defense Association’s Mike Donnelly, and Dobson Institute Executive Director Tim Clinton, who is also president of a national Christian counselors association and is affiliated with Liberty University. The discussion was emceed by Jenna Ellis, director of public policy for the Dobson Family Institute. Farris argued that parental rights, like religious liberty, should be seen on the same human rights plane as protection against genocide. Interestingly, Farris’s assertion of the absolute primacy of parental rights seems to conflict with ADF’s defense of a teacher in Indiana who refused to abide by the school district’s policy that teachers refer to transgender students by their preferred name and pronouns—even though students “must have written consent from a parent and doctor” to request the name change in the school district’s database. In other words, when it comes to trans kids, ADF, the largest Religious Right legal organization, is fine with a teacher overriding parents’ judgement about what is best for their own children. Tony Perkins, a recent appointee to the U.S. Commission on International Religious Freedom, made a brief but refreshing departure from the Religious Right’s adoration of Vladimir Putin, criticizing Russia’s recent attacks on the rights of Jehovah’s Witnesses, which include the threat of children being taken from their parents. That statement, like Perkins’ appointment to the USCIRF, is nothing short of remarkable given that Perkins and FRC’s Executive Vice President Jerry Boykin have taken a very selective approach to religious freedom for their fellow Americans. Perkins and Boykin have both made the kind of rhetorical attacks on Islam and the rights of American Muslims that a group of former diplomats recently warned are making it harder for the U.S. to credibly advocate for religious minorities facing persecution in other countries.